The Optimus Red sound level meter is for measuring sound levels in factories and other work environments in line with the occupational noise regulations. Let the meter take the strain - The Optimus Red has been designed specifically for occupational noise measurements. Rather than being a general purpose meter that leaves you trying to select the correct measurement range and parameters, the Optimus Red does it all for you, recording all the measurements that you might need now and in the future. Lower cost meters are available (even within our range), but they may not meet the standards demanded by the regulations and will not be Integrating as required for some occupational noise measurements. They will certainly not be so powerful or easy to use. Most occupational noise regulations state that you should use at least a Class 2 Integrating Sound Level Meter that provides you with measurements of LAeq and LPeak. The meter should be verified by a suitably equipped laboratory when new and every year or two years. You also need a Calibrator to check the meter's function before making measurements. For occupational noise measurements with noise exposure calculation we recommend the Noise Measurement Kit CK162B. This includes everything you need for a full occupational noise survey. Where the noise levels are particularly high, we recommend Optimus Red with Octave Band Filters, which gives the ability to assess the level at the ear when wearing different hearing protectors. See the Optimus with Octave Band Filters page for more information. 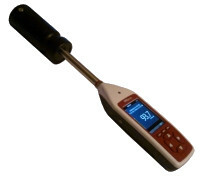 The Optimus Red Sound Level Meter measures all the parameters that are needed for an occupational noise survey. What's more, it measures them all at the same time, so there is no need to work out which measurements you need before starting. 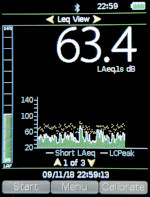 The meter's display shows the main parameters that are needed when making noise at work measurements: LAeq or Lavg (average sound level), LPeak (maximum peak level) and the current sound level. With a button push or two, it can also show more detail, such as Dose %, LEPd, exposure, memory and calibration status. The bar on the left of the display shows the current level, changing to yellow and then red when the sound level goes above the defined action levels (usually 80dBA and 85 dBA). Although the display shows only the commonly used parameters (LAeq, Peak, etc), this data logging meter stores the sound levels for all time and frequency weightings, along with a time history for the more common ones. Summary - These "overall" values describe the noise for the whole measurement period. They include the Max and Min values for all frequency and time weightings, along with the all important Leq (A, C and Z weighted) Lavg, and Peak (C and Z weighted). Time History - The meter can be set to store time history measurements at one of a number of rates between 10 ms and 2 seconds. It stores the Leq (A, C and Z) and the Peak (C and Z), giving a very informative graph of the noise over time. This is particularly useful when monitoring for long periods. An easy and reliable way of making on-site notes with your noise measurements. Make a brief recording (either your voice or the actual noise) just before taking a measurement. Before starting a measurement, the meter will ask if you want to record a "Voice Tag". The meter will record any speech or the noise in question (to help you identify it later) for up to 30 seconds. This audio is transferred to the software automatically along with the measurement. The Optimus Red was designed specifically for occupational noise measurements in line with the noise regulations. It provides all the noise measurement parameters that you need in a meter of the correct grade. This meter can be used without a computer, manually noting down the important parameters, such as Leq, Lavg and Lpeak. However, it stores all the measurements for download to the NoiseTools software, which is included. Most regulations and guidelines state that the meter's calibration should be checked before making measurements, and that you should keep records of these calibration checks. Fit the Calibrator over the microphone as shown, switch it on and press the Calibrate button. The meter will automatically make any adjustments. Calibration details are stored in the meter so that you can either make note or download them to a computer for inclusion in noise reports. To start a measurement, simply press the Start key, shown on the right. This process is the same for any model of this meter, whether you have data logging or not. The meter will start measuring the average and peak (the main parameters needed for Noise at Work), along with a few other useful parameters. When you are happy that you have measured for long enough (the average has settled for example), simply press the Stop key. The meter will store the overall values for LAeq, Lavg, LCeq, LPeak and a few others. It will also store these parameters every second, or whatever rate the meter is set to. This is all done automatically, there is no need to tell the meter to store them. Once you have finished making measurements, they can be downloaded to a computer using the NoiseTools software provided. Many occupational noise regulations recommend a second calibration check, at the end of the measurement process. This ensures the meter's performance hasn't drifted since the start. Armed with the Leq, Lavg and Lpeak measurements, the final stage is to calculate a worker's actual exposure, TWA or % Dose throughout the working day. This can be done manually or the NoiseTools software can do it for you and produce reports for your records. There are not too many options for the Optimus Red sound level meter, as even the basic model includes all the parameters that you need for occupational noise measurements in line with the regulations. Additional features, such as octave band filters, can be fitted in future, so you can decide later if you are unsure right now. Class 1 or Class 2? - Most occupational noise regulations say Class 2 is adequate. Calibrator - The noise at work regulations state that you should have a calibrator. The most important of the accessories is the Calibrator. The regulations state that you should use one to check the function of the meter before and after making any measurements. The Noise Measurement Kits, order codes CK162B and CK161B, include a sound level meter, calibrator of the correct class, windshield, software, carrying case and download cable. A Class 1 sound level meter is a little more accurate than a Class 2 model. It is also more expensive. If you are using the meter exclusively for occupational noise measurements then the regulations are quite clear: Class 2 is adequate. For this reason we recommend the Class 2 model. However, if you need to make other noise measurements, such as noise emitting from your factory into the local environment, then it might be wise to go for a Class 1 meter. In these instances the local authority (Environmental Health Officer for example) will usually expect measurements made with a Class 1 meter. With this option fitted, the meter splits the spectrum into bands to provide information about the frequency content. Meters with the Octave Band option always have the Data Logging option fitted too. Octave bands are very useful when monitoring areas with very high noise levels. 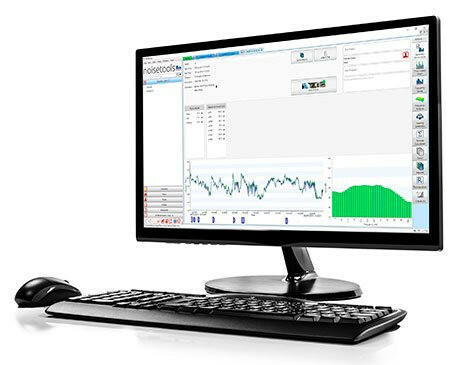 The octave band measurements are used by the software to calculate the level at the ear when wearing different hearing protectors. This option can be added at a later date without returning the meter. For this option please visit the Optimus Red with Octave Band Filters page.